At Viking Overhead, we offer the best selection of high-quality products, including garage door springs. 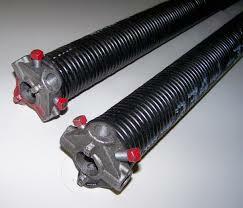 Garage Door Springs are the key component that assist in opening and closing your garage door. There are two main types of garage door springs, the first are called extension springs, which are located on the sides of your garage door. Extension springs are extended when the door is down and contracted when the door is up. Extension Springs usually run through cables that are attached to the bottom corners of the door. 1 spring lifts the left side and 1 spring lifts the right side of the door. Having independent springs with multiple lifting points typically make the door run crooked unless the springs are calibrated perfectly in unison. 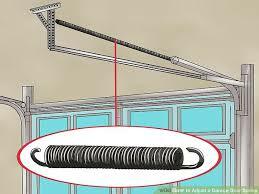 Our recommendation is using a torsion spring system for your garage door. 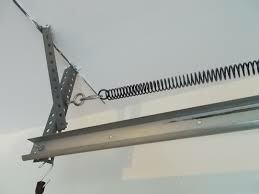 This type of garage door spring system balances the weight of your garage door with ease. A garage door, without the use of a garage door opener, or when lifting manually, should be easy to lift to the open position and close just as easily. In fact, a garage door that’s properly balanced can be lifted and closed by using only 2 fingers. If your garage door feels heavy to lift in the open position, your garage door may have worn, improperly installed, or you could have a broken garage door spring. Garage door springs in the industry have what’s called a cycle rating. One cycle is equal to one revolution of the garage door, from the down position, all the way up to the open position, and all the way back down to the closed position. 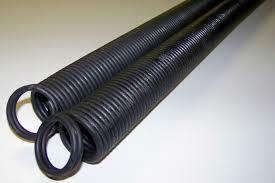 We use the highest-quality springs when repairing your garage door to ensure that it performs the way it was designed. Our springs are made from high-grade steel coated to help to prevent corrosion and reduce friction. Garage door springs that are part of a counter-balance system are usually located either along the sides of the door near the horizontal tracks or above the center of the door, attached to a long torsion bar that runs the length of your garage door horizontally. If your garage door suddenly becomes extremely heavy, or your garage door opener struggles or simply refuses to lift or close your garage door, you may have a broken garage door spring. 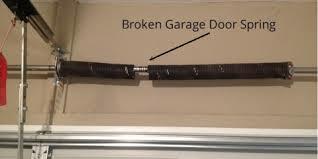 A broken garage door spring can occur at any time, trapping your vehicles in the garage because the door is too heavy to lift. You can visibly check for a broken garage door spring above your door to see if the spring is broken. In most cases, a broken garage door spring will be clearly visible. If your garage door is big enough to fit two vehicles, Viking Overhead recommends a two-spring setup. Some two-car garage doors have one spring attached above the garage door, because some garage door installers prefer to use one larger garage door spring which may not be able to balance the garage door properly. Not to mention, all the stress of a heavy garage door, meant to house two or more cars, will fail faster with one spring rather than two. For smaller one-car garage doors, one spring is usually enough, but one spring for a big door is often times a common error, causing a broken spring that has to be replaced more often as well as promoting premature wear to you garage door opener. Heavier garage doors, such as wood or wood faux doors often require even more springs in order to operate properly, the number of garage door springs depend on the weight of your garage door. At Viking Overhead, our trucks are outfitted to fix your broken garage door spring on the spot! And our technicians have the knowledge base and skill to fix any broken garage door spring.